2019 Link for the Game Manual!! Hey everyone! Here's the link for the rules to Destination: Deep Space! Winnovation Robotics open house is on February 17th from 1-4p.m. Come enjoy cookies and stay for the robots!! Lets start our season out great! The Rules have been updated...Again. If you still have any questions feel free to ask on the Q/A form. Winnovation FIRST Robotics Team 1625 kicks off the 2018 season with the annual Pancake Breakfast and Flapjack Challenge. The breakfast is on Dec. 1, 2018 at the Winnebago High School cafeteria. The pancake breakfast is from eight o’clock a.m. to four o’clock p.m., and the flapjack challenge is from is from ten o’clock a.m. to four o’clock p.m. The event includes pancakes, the flapjack challenge, which is the mini-bot competition, a bake sale, and a basket raffle. The basket raffle winners are drawn at noon and do not need be present to win. Tickets are three dollars for children 5 to 12 years of age and five dollars for adults. Do you like making things? Maybe drafting? Maybe Marketing is in your future? Come learn about a team where you can learn LOTS of life skills and discover your future! 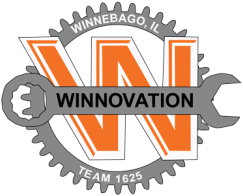 FIRST Robotics Team 1625 Winnovation is kicking off its 15th season on Monday, Oct 1, 6:45pm at the Winnebago HS Cafetorium. ​ Extra bonus -- see and learn about the Sheriff's Bomb robot!! Come Join us at the Bot Shop on Monday nights at 7PM for training for subteams! Learn the ropes of being a member and what you can do in each department and get to know our members! On July 28th, we will be hosting the Rock River Off Season Competition! Come see us and help out at Rock Valley College in the Physical Education Center with our competition! It is free to visitors. Wear closed toe shoes so you can come down to the pits! If there are any questions let us know! Don't forget to sign up for our Summer camp! With summer fast approaching, we are getting our annual summer camp underway! Here are the forms to sign up for our camp! After spend a lot of time and dedication on going to Worlds we are able to go and compete with some of the best teams in the world. We were able to work together and even though we were not chosen for Eliminations, we are proud of our achievements. We won the Excellence in Engineering award! Our IRI application was sent in and we are anxiously waiting for our response. We will hold our Sponsor Appreciation Dinner on May 22nd at 6:00PM at the Winnebago High School Cafetorium. We will also be hosting our annual science fair June 18th through the 22!! GO WINNOVATION! !